Get an easy work life for your MacBook, Notebook or Tablet(Windows 8.1)! HIS Multi-View USB Portable Docking Station organizes your peripherals in 1 device, 1 plug, external monitor workstation at 1 time! 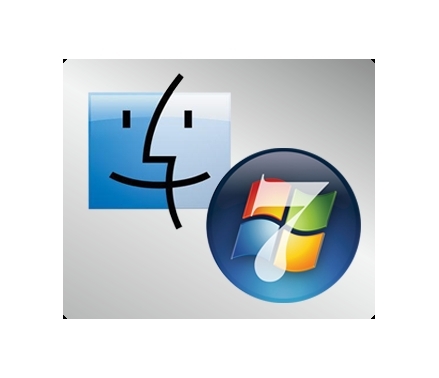 Get an easy work life for your MacBook, Notebook or Tablet(Windows 8.1) ! HIS Multi-View USB Portable Docking Station organizes your peripherals in 1 device, 1 plug, external monitor workstation at 1 time! Organize all your device and peripherals at once by simply plug in the USB 3.0 cable to your device. Now you can brings your USB device, internet router, video output together with one USB cable! Turn your MacBook, Window Tablet and laptop into a control center with only 1 plug and play action. 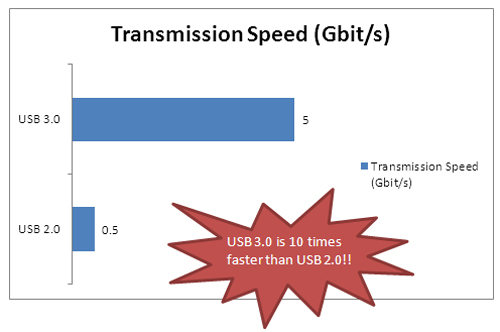 Being 10 times faster than USB 2.0, USB 3.0 has transmission speed up to 5 Gbit/s. 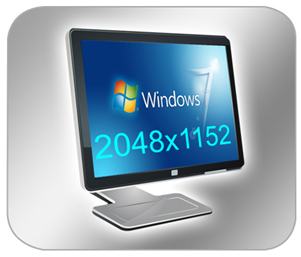 A lot of time will be saved on synchronizing and can be spent on more important things. With Full HD 1080p support & HDMI Output, the device delivers high quality HDMI 1920X1080 graphics PLUS sound, enabling seamless full-screen video playback over USB. 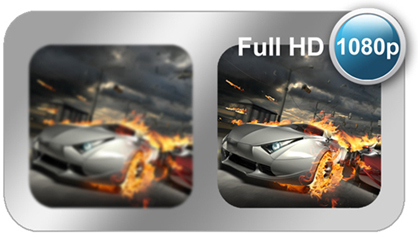 Watch HD, listen HD and feel HD - Enjoy the beautiful and crystal clear sound apart from the superb graphics now!. Many of the ultraportables today are thin, lightweight and easy to carry. However, the main issue with these laptops is the lack of extension ports. As an administrative staff in an institute, I need ultraportable to go along with me during my work. I have to do PowerPoint and Keynote presentations in various occasions. Furthermore, I need a more secured connection in order to access the server, which a wired connection serves a better job than a wireless one. That’s a big issue aroused – I need to carry lots of adapters with my laptop when I go out to work? Or I just carry a heavy all-in-one laptop in order to get rid of all these adapters? I own two laptops from two different Worlds – a MacBook Air and a Microsoft Surface Pro 3. I started to search for solutions for both of them. For my Macbook Air, I purchased both a Mini-DisplayPort to VGA adapter and a USB Ethernet Port and they cost me HKD$456. I have encountered a situation that only HDMI video input was available for the HDTV and I could not get my Macbook Air plugged. As a result, I had to purchase an additional Mini DisplayPort to HDMI adapter for HKD$278. It is no doubt that I can use all three of them on both my Macbook air and the Surface Pro 3. However, it would be a totally different user experience when I have to carry all these 3 adapters along with my ultraportable. In other word, it loses the true meaning of ultraportable. Will there be a single solution for all these connections and it works well on Mac and PC? 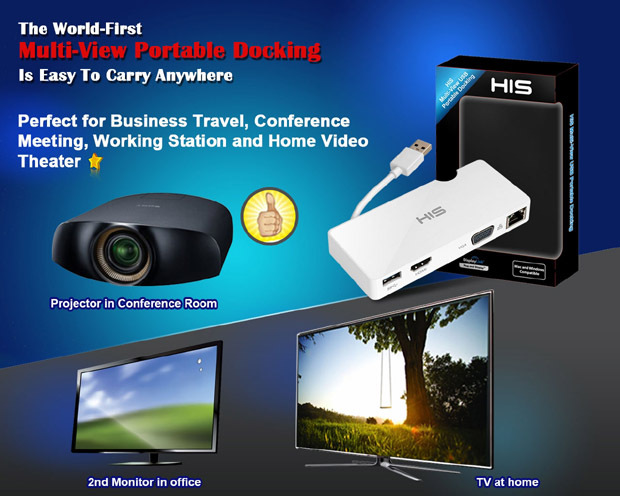 I searched online for a perfect solution for all my needs and find the HIS Mulit-view USB Portable Docking Station. It is a portable USB docking station with all the ports I need – a VGA output, a Gigabit Ethernet Port, a HDMI port and a USB 3.0 port. The USB 3.0 port is a bonus for me as there is only one USB 3.0 on my Surface Pro 3. If I have to plug in a thumb drive or a USB external harddisk, there will be no extra port for me to connect my Surface Pro 3 for an Ethernet adapter. The most important feature of the portable docking station is the low power consumption. It can be powered by a single USB 3.0 and I don’t need to carry an extra AC adapter for all these 4 extra connections on the portable docking station! I can really enjoy working with ultraportable with only a single portable station as it only weights a 100g more. This products saves a me a lot of time every day when I arrive at work or home with my notebook. The docking station is laying there on my desk with all the cables from my external monitors, USB hub and network cable plugged in. Instead of plugging all those cables in and out of my notebook every day when I arrive and leave from work I just plug in one USB cable from the docking station to the notebook and everything is connected and up and running. This product is like a notebook docking station but even better as it has a graphic card that supports external displays, it is much smaller and can be used with any device through USB. The performance is great for office applications and if you would like a few extra monitors for that computer game the docking station supports Direct X 10 and 11 as well. I recommend this product to anyone who would like to add more displays to their computer through USB and as a docking station in the office to simplify the task of plugging and unplugging cables every day. “It's quite small and extremely light, making for easy transportation. It feels well-made, I wouldn't expect a few drops or knocks to worry it at all. 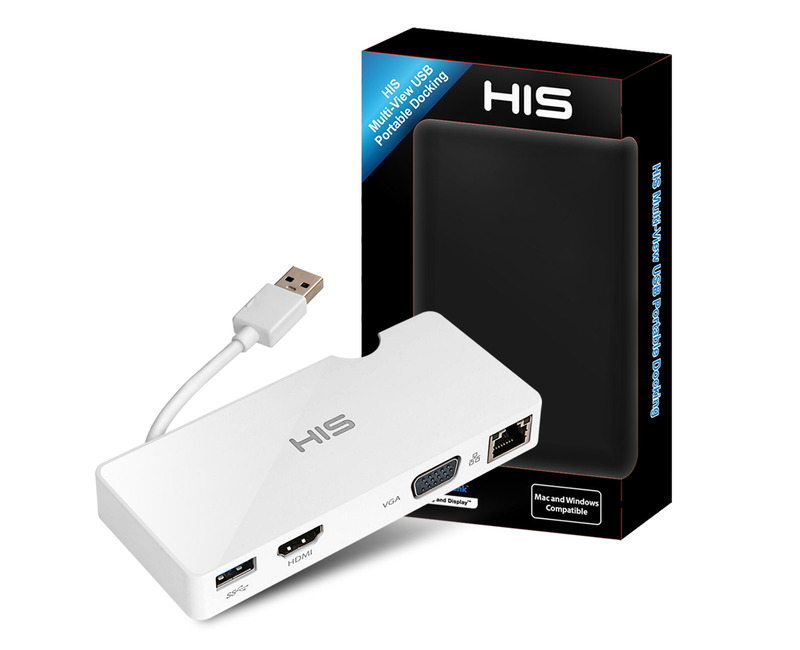 “For people constantly on-the go, the HIS Multi-View USB Portable Docking station comes to help by providing an extra HDMI port, one VGA port but also one Ethernet gigabit port, all in a single adapter; potential customers will say that by plugging this device we will lose one available USB 3.0 port, but HIS had this in mind and has also provided one extra USB 3.0 to complement the lost one. “The HIS Multi-View can pack up practical and space-saving storage. Convenient for travel. Connections on the computer you can never have enough - space problems here mostly preprogrammed especially when you handled as filmmaker with a lot of peripherals. HIS's with the multi-view offers now a convenient dock. 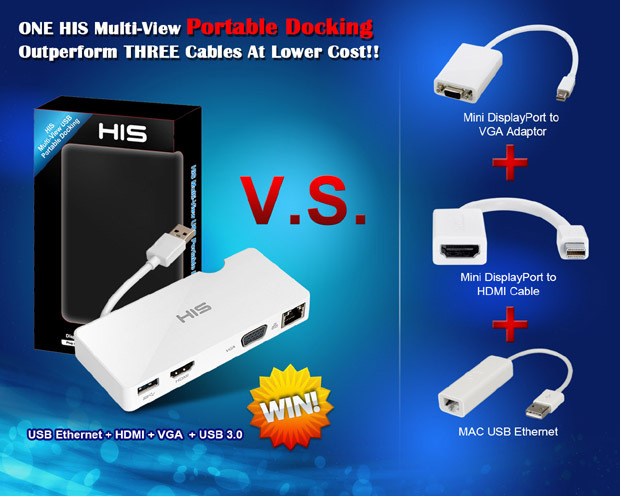 “The USB 3.0 Mobile Docking Station Multi-view of high-tech information system (HIS) can connect monitors or projectors without rebooting via HDMI, provides Gigabit LAN connection and also linked VGA monitors and USB 3.0 devices. 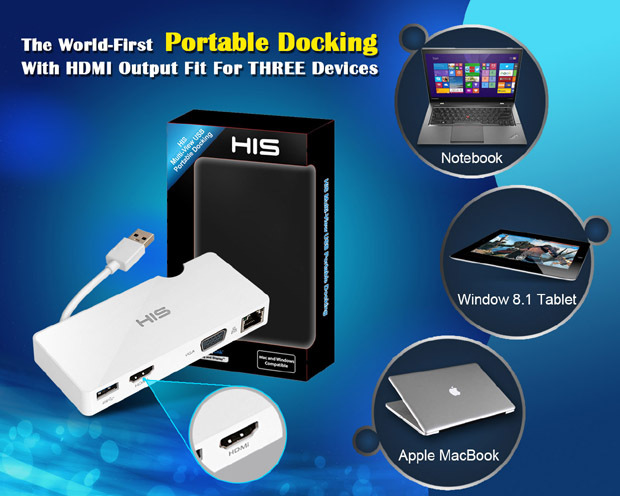 “The new HIS Multi-View USB 3.0 Mobile Docking Station can be connected, for example via the USB port on your notebook or desktop PC and provides more connection options for devices. 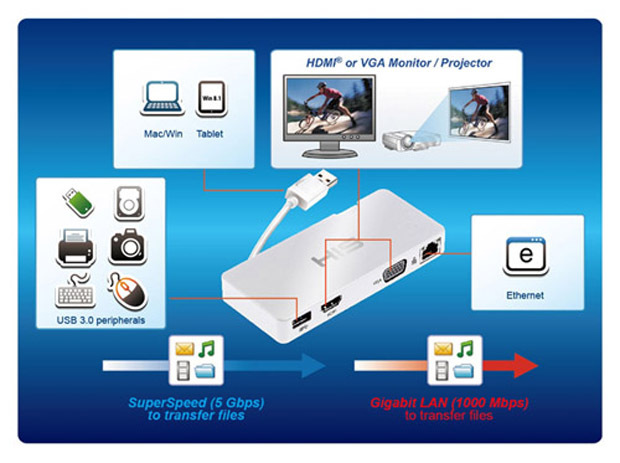 It is a USB 3.0 port on the docking station for USB devices available, VGA / HDMI ports for monitors and televisions and also a Gigabit Ethernet LAN interface for networking. 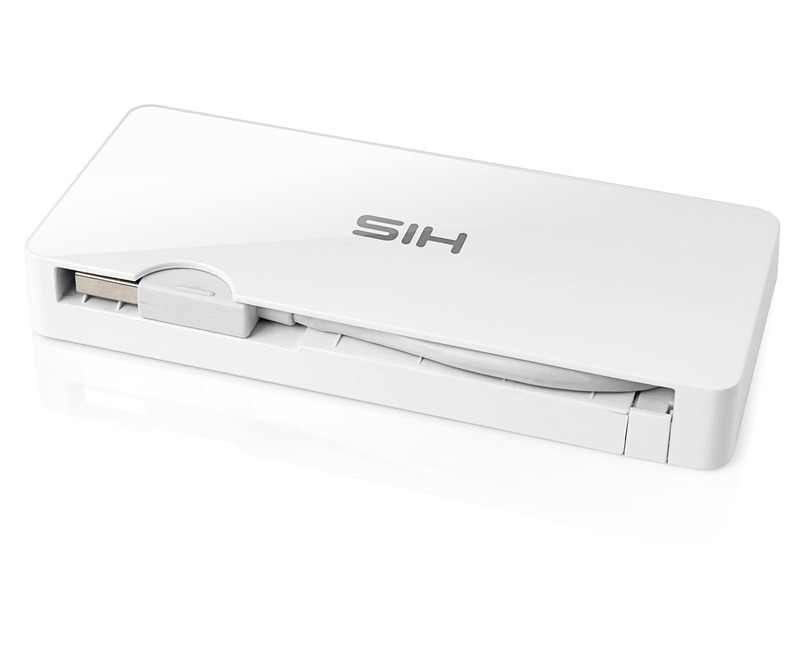 “The HIS USB 3.0 Mobile Docking Station is kept compact, and thanks to the white surface, it offers also a very elegant appearance. 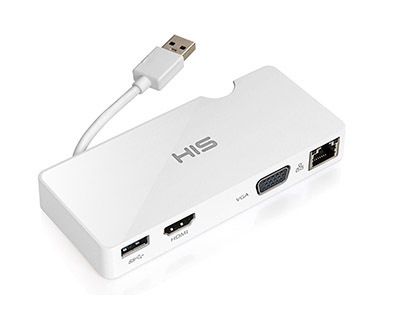 HIS is not with the equipment on a simple extension of the USB ports, but instead provides different connections, which are ultimately combined via USB 3.0.